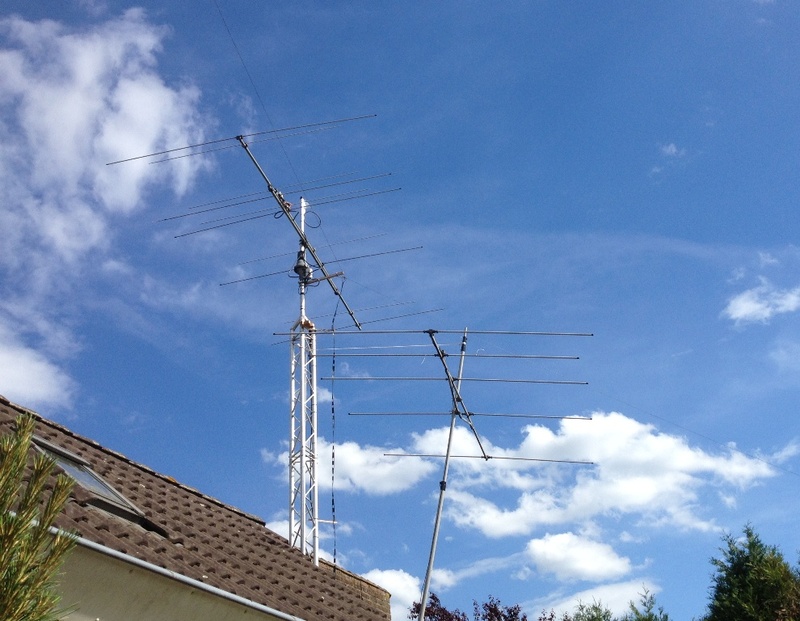 After putting up the 5+5 element YU7EF 6/4 metre dual band antenna, I was curious how the new antenna performs. Although I realise that a real measurement requires quite a bit of effort, a simple comparison between the new antenna and an antenna with a more or less known performance at least gives a clue about the performance. A 5 element Tonna (boom length about 3.5 m) was put into a fibreglass mast and pulled up with a rope, that runs into the tower. The Tonna was modified a long time ago. The feed system was replaced with a 1:4 balun and hairpin feed. The original antenna had no choke or balun, so common mode currents spoiled its performance. At the time, I put the Tonna into my tower together with a 6 element yagi with 7.4 metre boom length. The Tonna had about 3 dB less gain than the longer antenna, which had a little over12 dBi gain according to the computer model. The YU7EF dual band outperformed the Tonna with a slightly stronger signal. The signal to noise ratio was comparable, as the Tonna received both less signal and less noise. In my current environment, that is not a surprise. But the stronger signal indicates that the YU7EF is better on transmit. The little experiment strengthens the confidence in the YU7EF design. According to computer models, the YU7EF should have about 10 dBi gain, whilst the Tonna is calculated to have around 9 dBi gain.